It looks for similarities in different photos and easily finds duplicates as well as images of the same pixels. The program identifies rotated images, edited, cropped and photos taken using different camera settings. The program identifies flipped images, rotated, edited, cropped and images taken using different camera settings. 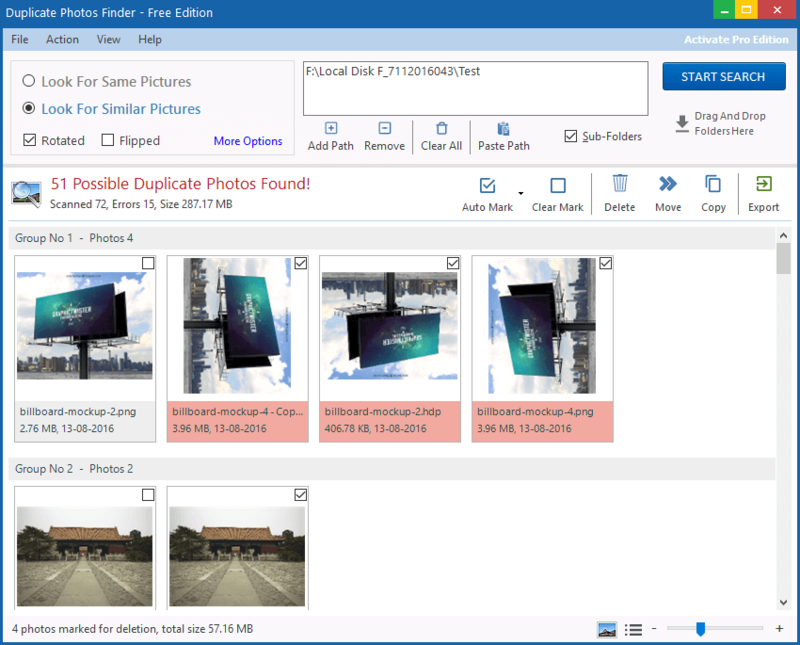 Duplicate Picture Finder can identifies resize pictures, rotated photos, edited images, cropped and flipped photos taken using different camera settings. Faster and easier ways to select which duplicate files to delete. The Selection Assistant lets you mark files by groups, dates, drives, folders and more. The built-in image viewer allows you to view the pictures in the duplicate group side-by-side, for comparison. This will aid in deciding what to keep. "I used DPF to eliminate thousands of duplicate pictures on my hard drive. It is easy to use and very fast. I especially like the fact that you can search any one folder or the entire drive. It has saved me days of hand labor." People who maintained a large collection of digital media, whether photos or images may end up with many copies of the same images or photos. And if you do not remove all the unneeded copies of the same picture files, your hard disk will become full with images you don't really need. Ashisoft Duplicate Photo Finder helps you find and remove duplicate picture files, which are not needed and thus help you to create a neat and organized library of photos collection. Duplicate files of all types can be a problem, especially if you're running low on disk space. By using Duplicate Image Finder you can find and remove them easily. Ashisoft's Duplicate File Finder searched not only our hard drives but also removable drives, so it can find duplicates on a memory stick or thumbdrive before you transfer them to your PC. It also searches networked PCs. It's easy to use, fast, flexible, and offers lots of help. If you have a large collection of any type of digital media, whether it be photos or music, odds are you'll end up with duplicates. Hard drives are so big nowadays, it's not so much a matter of saving space as it is having a neat and organized library of digital data. The interface of the program is clean and easy to navigate through. You can get started by adding paths that Duplicate Finder will look through. So, you can look for files with the same names (and with the same extension, by default) or byte by byte. Let Duplicate Photo Finder find all the duplicate photos and recover valuable disk space! P.S. Duplicate images may also known as repeated, dupe, same, double files, identical or file copy/copies and considered as unnecessary, unwanted, unused, redundant and junk files unless for purpose. The process to remove duplicates is called deduplicate, dedupe, deduplication. Duplicate Photo Cleaner will easily help you find and delete duplicate pictures.